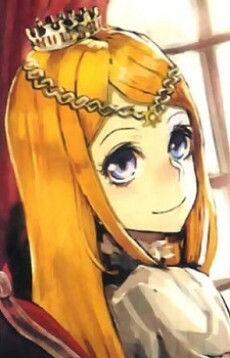 Renner is the third princess of Re-Estize Kingdom and the childhood friend of Climb. She is also known as the Golden Princess for being a reformer who brought major changes within the kingdom such as the ban on slavery. She is the youngest daughter of King Lanposa III and the younger sister of Barbro and Zanac. Renner is described as a young girl with long golden hair, silky smooth and supple as it drapes over the back of her neck. She has vibrant, dark blue eyes that shine like sapphires filled with warmth. She wears a fashionable white dress which further strengthens her image of purity. Around her neck hangs a golden necklace, appearing to symbolize her noble soul. Renner is known publicly as the Golden Princess for her benevolence and kindness. While she is believed to be a saint, in reality she has a psychopathic personality and doesn't care about the feelings of others. The only exception to this is her childhood friend, Climb. If Climb was wounded, she would declare that anyone involved would be ruthlessly killed.